The Druk Padma Karpo School is an exciting landscape project with a rich history. Tom Turner shares the story so far, and discusses how volunteer landscape architects can be a part of it. Ladakh is in India’s ‘Abode of Snow’: the Himalayas. It has fabulous mountains, lush valleys, a desert climate and a rich flora. In 1992 a group of villagers asked their spiritual leader, the Gyalwang Drukpa, for help in making a new school. He agreed, but wanted it to have a garden. The Buddha was born in a garden, raised in a garden, lived in gardens, died in a garden and established a faith that led the development of gardens in South East Asia for two millennia. 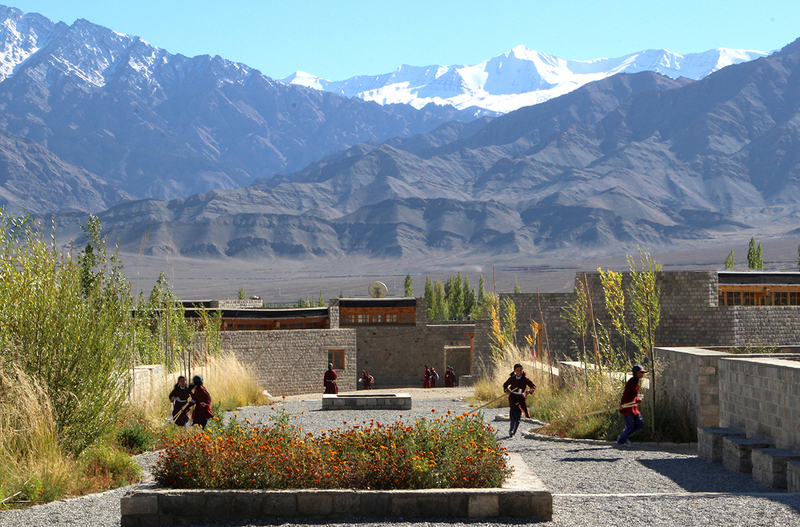 The Druk Padma Karpo School was designed, by the school’s founder and Arup, as a Tibetan mandala. Classrooms are arranged are on a nine-square grid within a circle. There are 820 students, 345 of which are residential. Modern technology and Ladakhi construction techniques were used to develop a highly sustainable design. It uses solar power, composting toilets, Trombe Walls, local materials and local design traditions. Being Buddhist-influenced, but not a sacred space, the school is a well suited to the design approach known as ‘Green Buddhism’. Great progress had been made with the school by 2010. Then disaster struck. A one-in-a-hundred-years storm hit the Indus Valley. Rain, hard enough to cut flesh, liquefied the scree above the school. A mudslide swept through the campus, half-filling classrooms with mud. Arup then designed a flood protection barrier, known locally as the Great Wall of Shey, in the process changing the school campus from an open windswept desert into an enclosed windswept desert. This created an opportunity to plant a garden, helped by volunteer landscape architects, mostly from University of Greenwich. The landscape strategy and design emerged from a vision of a highly sustainable learning landscape, with core elements of food growing – including orchards and vegetable beds – and timber production for repairs and maintenance. Inspiration for planting construction and design was taken from the local vernacular, with an innate emphasis on a productive and multifunctional landscape, despite the harsh climatic conditions. Three hydrozones correspond to Ladakh’s three agricultural soil types: stony land (Rizhing), meadow land (Thang Zhing) and rich land (Zhing). Future planting will use a wider range of native species, on Rizhing, to form a regional botanical collection. Plants from outside Ladakh will only be used when necessary. More work on the planting strategy is due. An innovation for India is an Oudolf-inspired use of colourful flowers with Poaceae species. Stipas and other tall grasses flourish locally. The project’s construction manager thought that having them in a garden was crazy (but has come to like it). 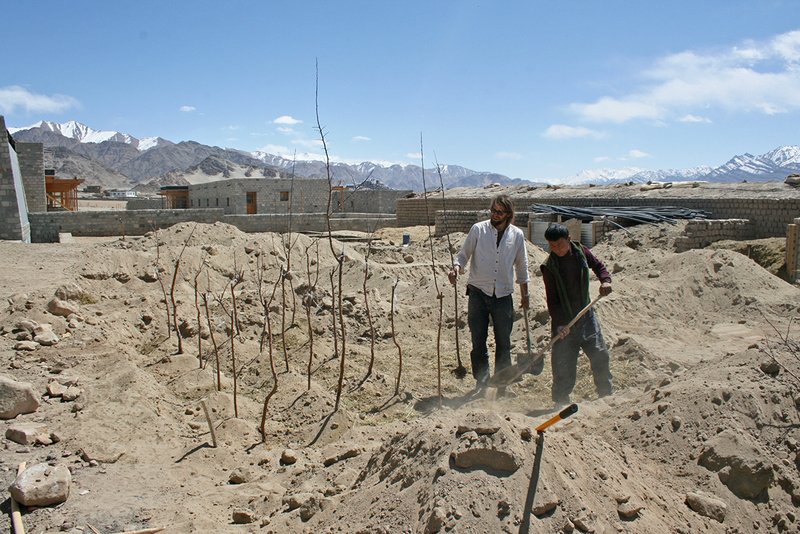 Our gardeners were more sympathetic: you can sell bundles of grass for 500 rupees in Leh. They are used to make roofs and brooms. The Dragon Garden, like the school, is being designed by volunteers* working in the collective spirit of anatta (‘non-self’). 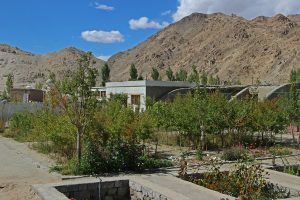 The first resident landscape architect, Yiannis, began collecting locally abundant species to grow on site, because Ladakh has no garden centres. The second, Simon, designed and supervised the building of a walled plant nursery, a sustainable irrigation system and India’s highest garden design office. It took two years to get the irrigation working. The fourth and fifth resident landscape architects, Elaine and Stuart, had the enormous pleasure of seeing water drip from underground pipes to make the desert bloom. For 2017, there are opportunities for self-funded volunteer landscape architects to go for about one month (the cost of travel and accommodation for volunteers from the UK is approximately £1,000). The resident landscape architect ordinarily goes for three months, with flight and accommodation funded by the UK charity Drukpa Trust. The landscape programme is active between April and September. Unfortunately, the school project does not have sufficient funding to support a resident landscape architect this year. Volunteering at the Druk Padma Karpo school is a character-building experience. It would be wonderful if firms followed Arup’s example with unpaid leave for staff to take up these volunteer opportunities (particularly if they contributed towards the costs for their employee’s development). The selection process sees Drukpa Trust, the design team leader at Arup Associates and Tom Turner interviewing a shortlist of candidates. They seek applicants with enthusiasm, common sense and practicality, experience traveling and working overseas, and interest in deserts, sustainability, and context-sensitive design. An ability to work with all kinds of people is essential. A commitment of one month at the school is required, and depending on the time of year, six weeks might be possible. If you are interested in volunteering, please send your CV and the month you would be considering travelling to Rachel at info@dwls.org. For more information on the school itself, visit the school website, www.dwls.org. See www.landscapearchitecture.org.uk for more information on volunteering opportunities.